Silicon life might look like animated crystals, as In this illustration from Dickinson and Schaller's book Extraterrestrials: A Field Guide for Earthlings. Structural elements could well be in threads, like fiberglass, connected by tensor elements to create flexible, delicate, possibly even filmy structures. 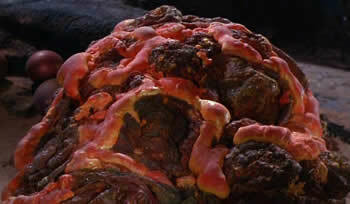 The Horta: silicon-based life in the Star Trek universe. All known life on Earth is built upon carbon and carbon-based compounds. Yet the possibility has been discussed that life elsewhere may have a different chemical foundation – one based on the element silicon. One is startled towards fantastic imaginings by such a suggestion: visions of silicon-aluminium organisms – why not silicon-aluminium men at once? – wandering through an atmosphere of gaseous sulphur, let us say, by the shores of a sea of liquid iron some thousand degrees or so above the temperature of a blast furnace. Thirty years later, J. B. S. Haldane suggested that life might be found deep inside a planet based on partly molten silicates, the oxidation of iron perhaps providing it with energy. At first sight, silicon does look like a promising organic alternative to carbon. It is common in the universe and is also a p-block element of group IV, lying directly below carbon in the periodic table of elements, so that much of its basic chemistry is similar. For instance, just as carbon combines with four hydrogen atoms to form methane, CH4, silicon yields silane, SiH4. Silicates are analogs of carbonates, silicon chloroform of chloroform, and so on. Both elements form long chains, or polymers, in which they alternate with oxygen. In the simplest case, carbon-oxygen chains yield polyacetal, a plastic used in synthetic fibers, while from a backbone of alternating atoms of silicon and oxygen come polymeric silicones. Conceivably, some strange life-forms might be built from silicone-like substances were it not for an apparently fatal flaw in silicon's biological credentials. This is its powerful affinity for oxygen. When carbon is oxidized during the respiratory process of a terrestrial organism (see respiration), it becomes the gas carbon dioxide – a waste material that is easy for a creature to remove from its body. The oxidation of silicon, however, yields a solid because, immediately upon formation, silicon dioxide organizes itself into a lattice in which each silicon atom is surrounded by four oxygens. Disposing of such a substance would pose a major respiratory challenge. Life-forms must also be able to collect, store, and utilize energy from their environment. In carbon-based biota, the basic energy storage compounds are carbohydrates in which the carbon atoms are linked by single bonds into a chain. A carbohydrate is oxidized to release energy (and the waste products water and carbon dioxide) in a series of controlled steps using enzymes. These enzymes are large, complex molecules (see proteins) which catalyze specific reactions because of their shape and "handedness." A feature of carbon chemistry is that many of its compounds can take right and left forms, and it is this handedness, or chirality, that gives enzymes their ability to recognize and regulate a huge variety of processes in the body. Silicon's failure to give rise to many compounds that display handedness makes it hard to see how it could serve as the basis for the many interconnected chains of reactions needed to support life. The absence of silicon-based biology, or even silicon-based prebiotic chemicals, is also suggested by astronomical evidence. Wherever astronomers have looked – in meteorites, in comets, in the atmospheres of the giant planets, in the interstellar medium, and in the outer layers of cool stars – they have found molecules of oxidized silicon (silicon dioxide and silicates) but no substances such as silanes or silicones which might be the precursors of a silicon biochemistry. Even so, it has been pointed out, silicon may have had a part to play in the origin of life on Earth. A curious fact is that terrestrial life-forms utilize exclusively right-handed carbohydrates and left-handed amino acids. One theory to account for this is that the first prebiotic carbon compounds formed in a pool of "primordial soup" on a silica surface having a certain handedness. This handedness of the silicon compound determined the preferred handedness of the carbon compounds now found in terrestrial life. An entirely different possibility is that of artificial life or intelligence with a significant silicon content. Those bricks were its waste matter... We're carbon, and our waste is carbon dioxide, and this thing is silicon, and its waste is silicon dioxide-silica. But silica is a solid, hence the bricks. And it builds itself in, and when it is covered, it moves over to a fresh place to start over. 1. Reynolds, J. E. Nature, 48, 477 (1893). 2. Wells, H. G. "Another Basis for Life," Saturday Review, p. 676 (December 22, 1894). 3. Ball, R. S. W. "The Possibility of Life in Other Worlds," Fortnightly Review, 62 (NS 56), 718 (1894).